NEW YORK, NY (March 8, 2016) – For the first time on record, Americans spent more than 13.5 billion dollars on combined (surgical and nonsurgical) aesthetic procedures in a single calendar year, according to the American Society for Aesthetic Plastic Surgery (ASAPS). The total reflects a 1.5-billion-dollar increase from 2014. Surgical procedures accounted for 58% of the total expenditures, surpassing the 8-billion-dollar mark for the first time ever, and nonsurgical procedures accounted for 42% of the total expenditures, surpassing the 5-billion-dollar mark for the first time ever. 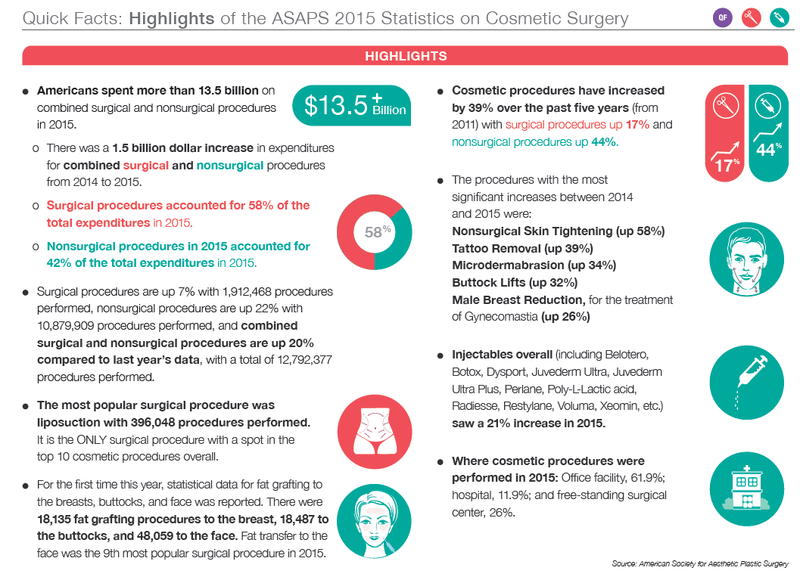 “Our industry’s growth is considerable, but not at all surprising,” states James C. Grotting, MD, President of ASAPS. “It reflects a healthy and robust economy wherein many people can afford to, and want to invest in themselves. As editor Joel Stein aptly pointed out last year in TIME Magazine’s article, Nip. Tuck. Or Else., more people now perceive aesthetic enhancements and procedures as essential. I personally believe the motivating factors for that are varied, but remaining competitive in the workforce is certainly a common factor. Youth is a commodity, and people are investing in themselves to maintain a younger, healthier appearance,” Grotting explains. Fat transfer to the face, (a new category for ASAPS this year) instantly landed in the top 10 surgical procedures in the number 9 slot. Nonsurgical skin tightening jumped from 9th to 7th most popular procedure in the nonsurgical category, while also securing the 5th spot for most popular procedures among men, replacing microdermabrasion in the top 5 for males. Labiaplasty, still considered a ‘new’ procedure, saw another increase in 2015, (16%) as did buttock augmentation, with a 21% increase in implants and fat transfer combined, and a 32% increase in buttock lifts. The two most popular injectables year-over-year, (botulinum toxin and hyaluronic acid) both saw continued growth, with botulinum toxin, (BOTOX, Dysport and Xeomin) surpassing 4 million procedures performed and hyaluronic acid, (Juvederm Ultra, Ultra Plus, Voluma, Perlane, Restylane, Belotero) surpassing the 2 million procedures performed mark for the first time this year as well. 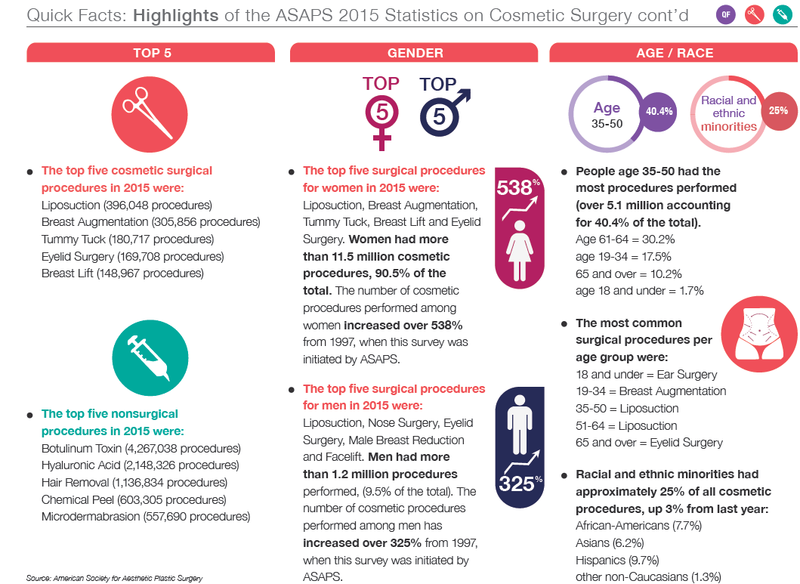 To obtain a full copy of ASAPS’ latest statistics, including a brand new PDF book containing press-ready infographics, please visit http://www.surgery.org/media/statistics.